The history of sports is spattered with relocations and expansions, but we haven’t had a relocation since the Sonics moved to Oklahoma City in 2008 and we haven’t had a league expansion since 2004 with the Charlotte Bobcats. For the NFL, the last expansion was in 2002 with Houston and the last relocation was in 1997 with the Houston Oilers moving to Tennessee. In the last five years, there has been much talk of a franchise in London and LA (the latter, more so). In talking with a good friend of mine, we came up with two plans that could have both of these possibilities become reality. Plan #1 is much more realistic, but Plan #2 is much more fun. I detailed the two plans in the images to come. Plan #1 is pretty simple. St. Louis confirms the rumors and ends up moving to LA, restarting the Los Angeles Rams campaign. Jacksonville moves to London as well. If we look at the current state of affairs for all NFL franchises, Jacksonville makes the most sense for the move (at least when this plan was conceived). While they have a new stadium, they have a reputation for disengaged fans. Further, their recent history has been pretty pathetic. Of any team to relocate, they are the prime candidates. 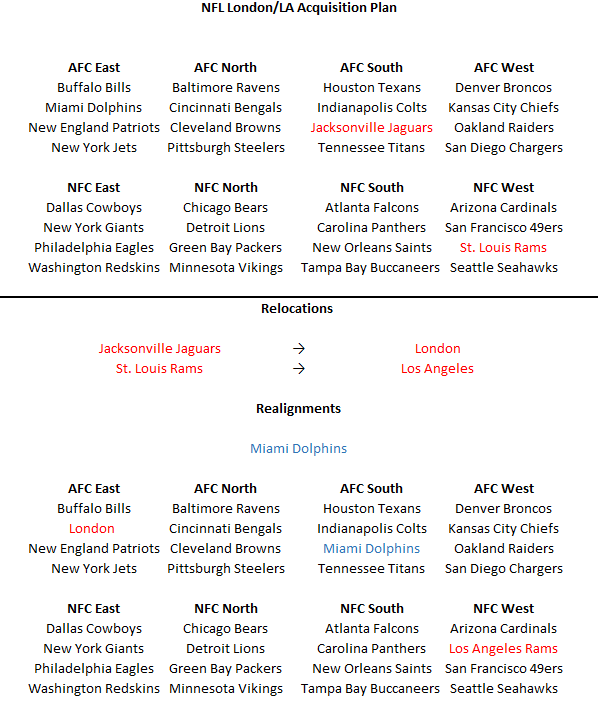 It would be easier for a London team to play divisional games with the northeastern teams, so trading Miami for the London franchise would reduce travel costs for both the AFC East and AFC South divisions. This was actually the first idea that we talked about and it ended up like a snowball rolling downhill. There was really one rule: NFC East and NFC North couldn’t be broken up due to the entrenched rivalries. It turns out the AFC West didn’t get broken up either, but that’s another division with very solid rivalries that shouldn’t be broken up. The other divisions were fair game, and each got a shuffle. Like with Plan One, Jacksonville gets moved, but they end up in the NFC West to join the Pacific Coast teams. This had to displace a team. Geographically, St. Louis doesn’t fit in with the other three, so they were left without a home. A logical home was to put them in the NFC South where they would be proximate to the other potential teams. Digressing, we always appreciated how exciting games were between Indianapolis and Cincinnati/Baltimore/Pittsburgh. Further, there has been a natural rivalry between Pittsburgh and Indianapolis and Baltimore/Indy have a very storied history together. Moving Cleveland out of a division with Pittsburgh and Cincinnati breaks an agreement that was made after the original Browns moved to Baltimore…but who cares, right? This left Cleveland without a home as well. 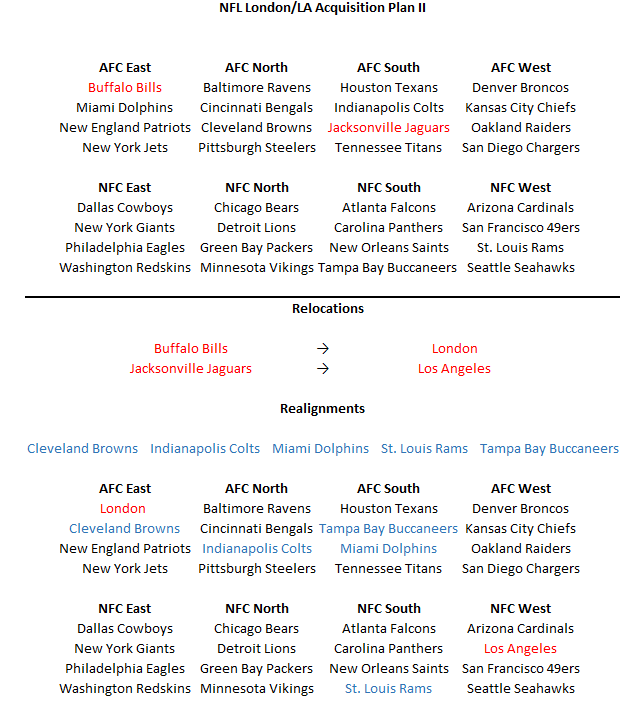 If we pushed Cleveland to the AFC East (because New England could use another whipping boy), that could let Miami go to the AFC South to replace Indianapolis, and Tampa Bay to replace Jacksonville. Those two being in a division to create another geographic rivalry. There is a lot of rearranging in that scenario, and it isn’t utterly realistic. I also wasn’t keen on relocating Buffalo considering their significance in NFL history. However, after we settled on the movements, I really do like this one better. It provides some potential excitement to franchises who have fallen on some rather unexciting times…except for the Browns. There are more pressing issues in Cleveland than who they play every year, though. Next Next post: How dare you, Tom Brady?